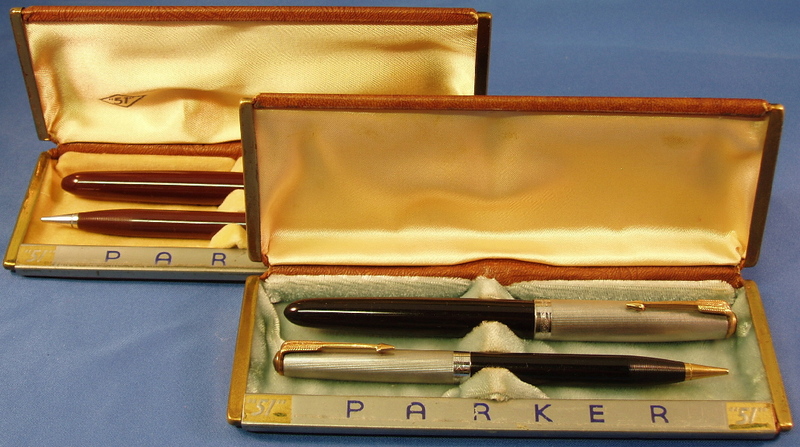 Parker produced a very wide range of boxes for the Parker “51”, for both single pens and sets. 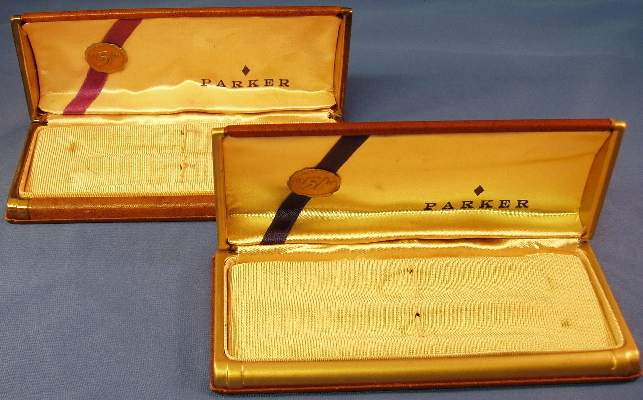 Some are basic cardboard boxes, but some were quite luxurious, such as the leather covered box for the early Parker “51” Presidentials. 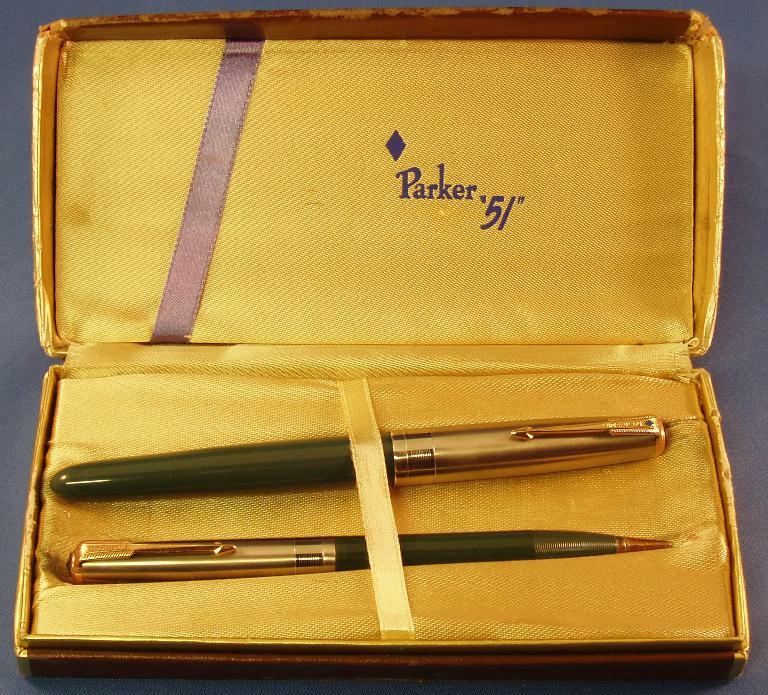 Most Parker boxes are numbered, but they are never dated. 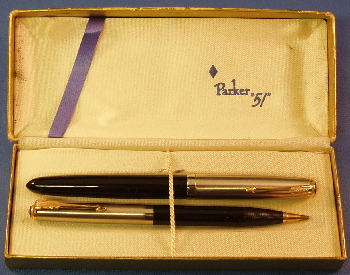 Nevertheless, by looking at ads of the era and New Old Stock sets found with instruction brochures and/or pens, one can come very close with the years in which they were used and the appropriate pens/sets for each. In addition to the traditional clamshell boxes, most also included an outter cardboard box or sleeve to protect the actual box. Prices of boxes are generally in the $10-$20 range, but can go over $100 for the rarer ones. Condition is essential in collecting boxes and the biggest challenge is probably finding a clean inside, as most suffer from pencil marks and/or ink stains and the lining is nearly impossible to clean. The outside is usually sturdier, but can get very soiled. Cardboard boxes do not stand up well to wear and are often ripped or badly dog-eared. Box no. 244 Made In U.S.A. This is a first year box ca. 1941, illustrated in the introductory “Jewels of Pendom” catalog for the high end “51” sets. 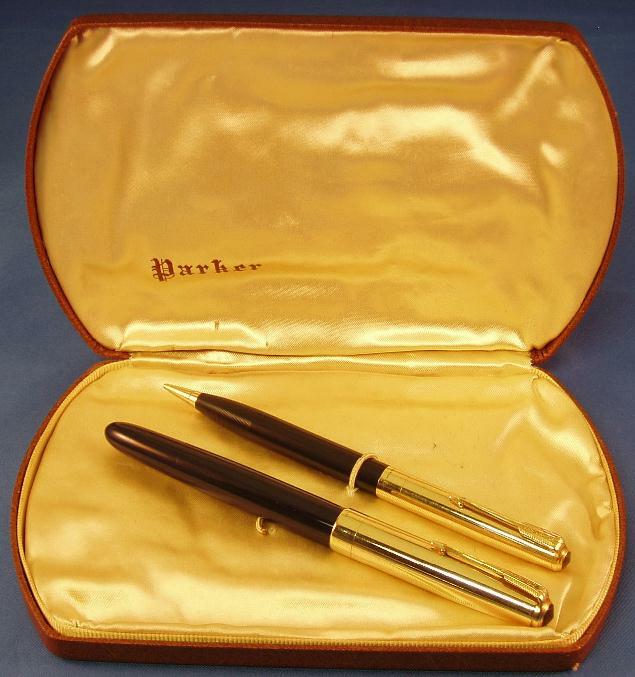 According to the catalog, it was used for the 14kt cap Heirloom sets and the 14kt trim Heritage sets. 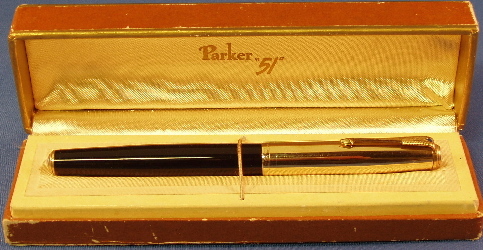 The box is almost identical to the later box used for the Signet, except that instead “Parker 51” in script, it has “Parker” in gothic letters. 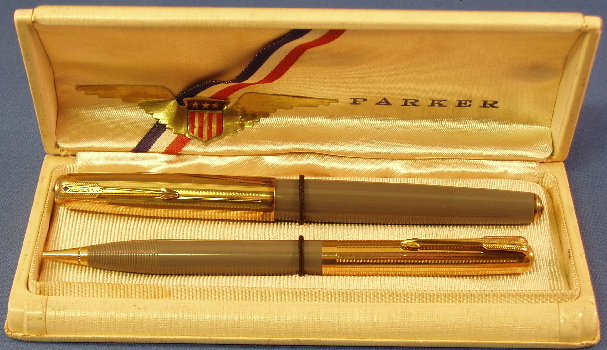 The set shown in this picture is a rare solid 14kt pinstripe caps with first year long clutch and a one line 1942 imprint and barrels in cedar blue. 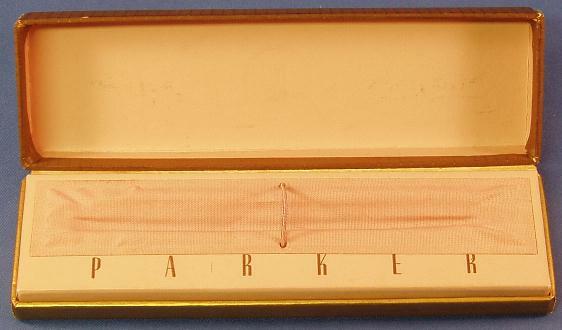 Cardboard box with satin lining, usually found with first year pens. Hard to find in good shape as the outside does not wear well. Early cardboad box, usually found with first year pens. Displays by flipping top onto the base. Leatherette covered cardboard box for a pen set. Box no. 252 Made in U.S.A.
A cardboard box with fake leather wrap-around. Not the most luxurious of boxes and hard to find in good shape. The set found in this box was dated 1944. Seems to be a box used during the war material constraints, as I have even found this boxed used on a 1945-dated Empire Set. Box no. Made in U.S.A.